When creating a DropIt rule, you have to use one or two asterisks. Using one may be trivial but what about two? And do you know what happens if you omit? Let’s make this clear. A single asterisk tells DropIt to scan for files. For example, “*car.jpg” rule means “all files with jpg extension that ends with car”, that is, “myCar.jpg” or “oscar.jpg”, and even “car.jpg”, too. This is similar to using the asterisk as a wildcard. To process all files, you can use rule “*. *”, but this will skip files with no extension. If you would like to include them too, use only an asterisk as a rule: “*” (available from version 3.7). Because this rule will process files with and without extension, you can eventually use this to process all files. Using two asterisks in a rule will instruct DropIt to look for folders. So using “Lot**” will match folders like “Lottery”, “Lot”, etc, all folders that start with “Lotus” (and even a folder named “Lot”). Since version 3.7 this message will not come up but DropIt automatically adds an asterisk before the filename. This is only an extra check to help users. To avoid this automatic insertion, you have to use asterisk(s). In this example, you wanted to copy a file, so one asterisk is needed. 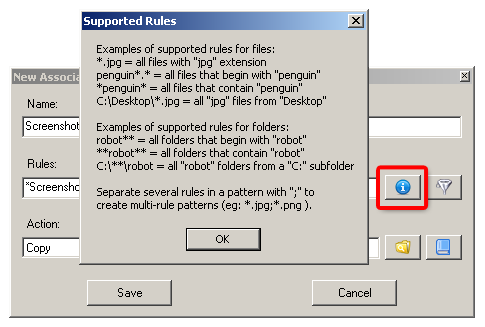 Add one to the rule – placement is not important but a good practice is to put it at the beginning or at the ending of the filename: “*Screenshot.png” or “Screenshot*.png”.